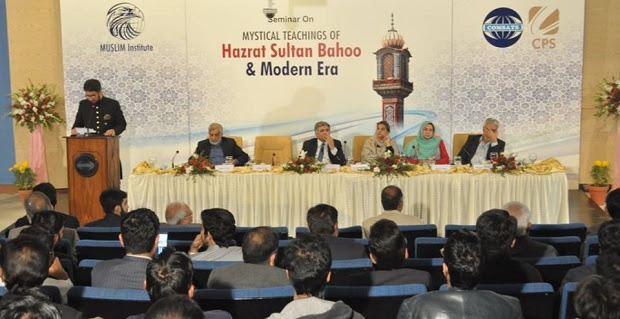 MUSLIM Institute and Centre for Policy Studies (CPS), COMSATS Institute of Information Technology (CIIT), Islamabad organized a seminar titled “Mystical Teachings of Sultan Bahoo & Modern Era” on Thursday, December 8, 2016, at CIIT, Islamabad. Former Chief of Naval Staff Admiral (R) M. Asif Sandila chaired the session whereas other prominent speakers include Chairman MUSLIM Institute Sahibzada Sultan Ahmad Ali, Head of CPS, CIIT Amb. (R) Fauzia Nasreen, Chairperson Dept. of History International Islamic University, Islamabad (IIUI) Dr. Mujeeb Ahmad, Former Director Iqbal International Institute for Research & Dialogue, IIUI Dr. Talib Hussain Sial and Principal Govt. Post Graduate College for Women, Rawalpindi Dr. Aalia Sohail Khan. Research Associate of MUSLIM Institute Mr. M. Azizullah Shah moderated the proceedings of the seminar. Diplomats, academicians, politicians, journalists, researchers and people from different walks of life participated in the seminar. Hazrat Sultan Bahoo, an eminent Sufi mystic of the Muslim world, is also known as Sultan-ul-Arifeen & Sultan-ul-Faqr due to his spiritual excellence. Hazrat Sultan Bahoo was born in the year 1629, in the city of Shorkot, nowadays part of district Jhang. His mausoleum is located near Garh Maharaja, district Jhang. 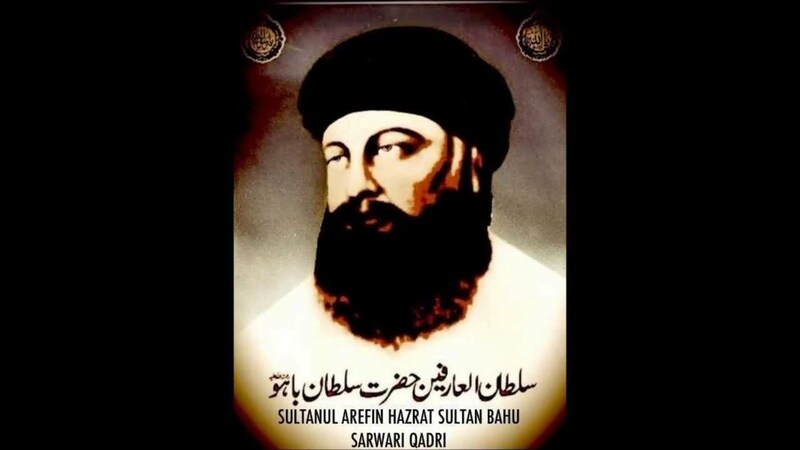 Hazrat Sultan Bahoo belongs to the Awan Tribe who are non-Fatimid decedents of fourth Caliph of Islam Hazrat Ali R.A. Hazrat Bazid Muhammad (R.A), father of Hazrat Sultan Bahoo, was a pious man and served as a military commander in the Mughal army. Similarly, Hazrat Bibi Rasti, mother of Hazrat Sultan Bahoo, was also from Awan tribe and a virtuous lady having a profound knowledge of spiritualism. She was spiritually intuited to name his son “Bahoo”. Hazrat Sultan Bahoo didn’t receive any formal education. He got initial spiritual training and education from his mother. He belongs to famous spiritual order Qadriya founded by Hazrat Abdul Qadir Gilani R.A of Baghdad and his shrine has the privilege of being one of the famous shrines of Qadriya spiritual order in sub-Continent and secures an eminent position in Qadriya order. In order to achieve spiritual excellence, he visited many Sufis of different orders but did not take the oath. At last, he was spiritually directed to take oath at the hand of Hazrat Abdur Rehman AlGilani R.A.
At his young age, sub-continent was being ruled by Emperor Shah Jahan who was succeeded by Emperor Aurangzeb. At that time the Persian language was dominant in sub-Continent. The Muslim world was facing political instability as well as intellectual decline. Hazrat Sultan Bahu’s efforts speak clear of the truth that how he manifested himself as a driving force against social evils as well as equipped general public spiritually to fight the menace of sectarianism and anti-Shariah Sufi rituals. +’s Punjabi Abyat are considered a fundamental source of Punjabi classical literature. Abyat e Bahoo also secures an eminent position being a part of course named Mystical Islamic Poetry by Oxford University. In this respect, School of Oriental and African Studies, University of London organized a session on Hazrat Sultan Bahoo & Hazrat Bulleh Shah’s poetry in 2015 in recognition of their contribution towards the Punjabi language. Hazrat Sultan Bahoo wrote down one hundred and forty books in the Persian language which include one book of poetry named Devan-e-Bahoo and other books are prose writings. Unfortunately, his Persian writings are not known much in the world. He is well known for his four line Punjabi poetry but not for his great philosophical work in Persian and it is a strange coincidence with Umar Khayyam who is also famous for his four line poetry, not for his prose work. A similar fate was faced by his other contemporary writers who contributed to Persian literature like Ghanimat Kunjahi was a Persian poet from Punjab and has great contribution in Persian literature but the world is unaware of his contribution. Similarly, daughter of Aurangzeb Alamgir, Zeb un Nisa has been neglected. Mirza Abdul Qadir Bedil is another example who is known in Central Asia but in our region, he is not well known. The Reason of this unawareness is that Muslims severed their relations with literature, therefore, Persian literature lost in history. The great contribution of Hazrat Sultan Bahoo in Persian has also fallen a victim to this negligence and world is unaware of it. It is need of the hour that we recover such precious philosophical heritage and work upon it. The recovered work of Hazrat Sultan Bahoo shows that it is second to none in terms of prose work in Persian. Hazrat Sultan Bahoo traveled to different places to spread the teachings of Islam. He also played a great role for the spread of peace and harmony in society. He has contributed a lot to eradicate the sectarianism and other divisions among Muslims. His efforts to establish knowledge friendly and spiritual oriented society are commendable and should be worked upon to unveil many important aspects of his philosophy & teachings. Language is not just the gift of God but also the disclosure of God. There are many functions which a language performs but one function is to connect human being with God and this is what the mystical poetry does. Allah Almighty is too great to be encapsulated in human words. All the mystical poets have confessed the inadequacy of language to explain mystical experiences. The letter Alif is reiterated in Sufi teachings and also in the teaching of Sultan Bahoo. One of Turkish poet Yunus Emre says that wisdom all four divine books are contained in one single letter Alif and the secret of this letter Alif is that it is actually the supreme name Allah. The word “Hoo” used in Sultan Bahoo’s poetry stands for transcendence of Allah, the infinitude of Allah and love for Allah. It is not possible to attain delights of spirituality without sincerity and truthfulness in all actions. Heart of human beings is the residence of the true God so the dignity of human beings is the main theme of Sultan Bahoo’s teaching. Iqbal says “The Ultimate Reality, according to the Qur’an is spiritual and its life consists in its temporal activity. The spirit finds its opportunities in the natural, the material, the secular (worldly). All that is secular is, therefore, sacred in the roots of its being… the merely material has no substance until we discover it rooted in the spiritual”. 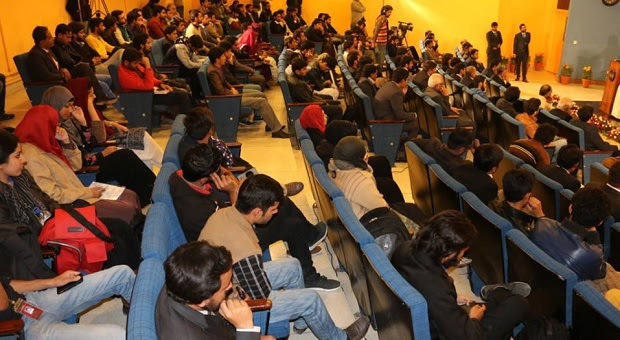 150th Session of reading and understanding of ‘Saiful Malook’ organized by Punjabi Sufi Sangat was held at the National Press Club, Islamabad, says a press release. It was presided by Sahibzada Mian Muhammad Sajid of Darbar Khari Sharif. A Huge gathering of Hazrat Mian Muhammad Bakhsh’s admirers was present in the function. Speakers paid rich tribute to Hazrat Mian Muhammad Bakhsh, the Great 19th century Punjabi Sufi Poet of Punjab and Kashmir, who wrote 17 books in Punjabi and one in Persian. Prof. Ashiq Hussain described the history of Reading and Understanding Sessions of Saiful Malook. He said that three years back the first session of Reading and Understanding Saiful Malook was started under the guidance of Prof. Saeed Ahmad, writer of Great Sufi Wisdom books. Ch, Irfan Ahmad Kiani, Raja Muhammad Akram also addressed the gathering. The program was conducted by Basit Subhani. Prof. Saeed lamented the attitude of government for disrespecting Punjabi language saying disrespecting Punjabi language means disrespecting 120 million Punjabi speaking Pakistanis. “People of Punjab, Kashmir and Hindko-speaking areas of Khyber Pakhtunkhwa should be taught the poetry of these Sufi saints. 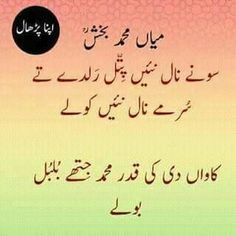 Poetry of Baba Farid Shakar Ganj (1175-1265), Baba Guru Nanak, Shah Hussain, Sultan Bahu, Bulleh Shah, Waris Shah, Hashim Shah, Malvi Ghulam Rasul Alampuri, Khawaja Ghulam Farid of ChachRaaN Sharif and Mian Muhammad Bakhsh of Jhelum-Mirpur, Pir Mehr Ali Shah of Golra Sharif, Sain Ahmad Ali Sain Peshawari is full of divine love & tolerance,” he added. Hazrat Mian Muhammad Bakhsh, one of the most famous Sufi poets of the Punjab, was born in 1830 near Mirpur, Azad Kashmir. His father Mian Shamsuddin was also a saint and was gadi-nasheen at the shrine of Hazrat Pira Shah Ghazi Qalandar. Mian Muhammad Bakhsh died on the 7th day of the Islamic month of Dhu al-Hijjah 1324 AH (1907 AD) and was buried in Khari Sharif. People from Punjab and Kashmir pay a visit to his shrine for getting the spiritual blessing. His works include Siharfi, Sohni Mahiwal, Tuhfah-e-Miran, Tuhfah-e-Rasuliyah, Shireen Farhad, Mirza Sahiban, Qissa Sakhi Khavass Khan, Qissa Shah Mansur, Gulzar-e Faqir, Hidayatul Muslimin, Panj Ganj etc. He also wrote a commentary on the Arabic Qasidat-ul-Burda of al-Busiri and his most famous work is entitled Safarul ‘Ishq (Journey of Love), but better known as Saiful Maluk. Mian Mohammad Bakhsh wrote eighteen books but his masterpiece that will keep his name ever glowing is no doubt Saiful Malook. He had done this great job when he was only 33-year old. Before writing Saiful Malook he had written books of poetry but those were not known to the public. The book Saiful Malook contains 9,249 couplets which are full of wisdom. He almost touched each and every aspect of life. Such sort of variety of various subjects you would not find in the poetry of any other Sufi saint of the Punjab. Hazrat Mian Muhammad Bakhsh passed his life in celibacy but he devoted his God-gifted life for the sake of contributing great mystic thought in the language of masses. It was his mother tongue Punjabi which has been badly ignored by all the governments in Pakistan since 1947 particularly. It is ironic that all the officials in the Punjab and Centre respect Sufi saints like Mian Muhammad Bakhsh but they do not like to promote the Punjabi language, in which these Sufi saints embedded pearls of wisdom, such wisdom which we need a lot in our day-to-day life. Let us rectify our previous mistakes and try to provide a high accolade to such great Sufi poets of the Punjab in our educational syllabus.